Q&A: What's Behind High Gas Prices? With average prices at the pump approaching $3 a gallon, filling up is causing American consumers increasing pain in the pocketbook. NPR's Scott Horsley looks at the issues surrounding high gas prices. Q&A: What's Behind High Gas Prices? Use the lowest grade of gas your car can take. Unless your vehicle owner's manual calls for premium gas, there's no reason to use it. Slow down. For every mile you drive above 55 mph, your fuel economy drops by 2 percent. And gas mileage tends to drop quickly at speeds above 60 mph. The EPA offers this rule of thumb: Assume that for every 5 mph you drive over 60 mph, you might as well be paying an additional $0.20 per gallon for gas. Drive in the highest gear you can, at the lowest possible speed. The slower your engine turns, the less gas you use. Don't accelerate when driving uphill -- it makes your mileage per gallon plummet. Instead, try to drive at the same speed, or even a little slower. Try to brake less by anticipating stops. When you brake, you waste the acceleration you've already used. Instead, try to accelerate slowly when leaving a stoplight, and then coast to the next light. Ditch your car's luggage rack, roof rack and related outdoorsy gear and put it away until you actually need to use it. The drag created from this gear can reduce your mileage per gallon by up to 5 percent. Get rid of the junk in your trunk. Every 100 pounds in the trunk can reduce your fuel economy by 1 to 2 percent. Get more tips from Car Talk. 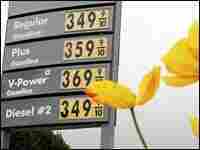 What factors are causing gas prices to rise so quickly? 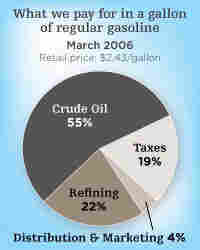 The biggest factor in rising costs is the price of crude oil, followed by the cost of refining. If a gallon of gasoline costs $2.90 (this week's average, according to the Energy Department), crude oil accounts for about $1.60. The cost of crude oil on the futures market has risen about 33 percent in the last year. This reflects supply problems in such places as Nigeria, Iraq and the Gulf of Mexico, as well as the threat of supply problems in Iran. Refining costs add another 64 cents or so to a gallon of gasoline. Refining margins have increased from a few years ago, and are especially high this spring, because many refineries are currently shut down for seasonal maintenance. Refineries are still recovering from the effects of last year's hurricanes. And they are adjusting to more stringent low-sulfur fuel requirements and the phase-out of the gasoline additive MTBE. The balance of the price is taxes -- about 55 cents -- and distribution and marketing costs, which account for about 11 cents per gallon. OK. So the rising cost of crude oil and of refining help account for the spike in gas prices. But at the same time, oil companies are reporting record net profits. They're being accused of price gouging. What's their response? Big oil companies are making most of their money by producing crude oil. They invested in oil fields when prices were much lower, with the expectation that they could break even at, say, $25 per barrel. Since the market price is now more than $70 a barrel, the extra money is gravy. It's like a farmer who can raise corn for $1.50 a bushel. If the market price is $1.75, he makes a quarter per bushel. If the market price jumps to $2.25, his profits jump as well. (If the market crashes to $1 per bushel, the farmer loses money. That can happen to oil companies as well.) Oil companies, like the farmer, are the beneficiaries of high market prices, but they can no more control those prices than a farmer can dictate what he gets for a bushel of corn. Critics would say the oil industry is far less competitive than the corn market, which is certainly true. But if oil companies could control the price of crude oil, they would not have allowed the price to fall to $10 a barrel as it did in 1998. Then who sets the prices? Oil companies don't set crude-oil prices; the global market does. Basically, the market decides what people are willing to pay at a certain moment in time. And a lot of that has to do with the fact that the world is getting richer. Countries like India and China are growing, and that has created more demand for oil and gas. In the United States, we're still going full throttle when it comes to energy use. At the same time, there have been supply disruptions and political instability in major oil-producing nations. So you have a situation where demand has been growing steadily and inexorably, and the system of supply is quite vulnerable. That's the basic recipe for high prices. If the market sets prices for oil, then what role does OPEC play? How does it affect prices? Traditionally, OPEC set limits on how much oil its member countries produce in order to keep the price higher than it would be in a truly competitive market (but not so high as to encourage development of alternatives). This often worked, despite widespread cheating by OPEC members, who often produced above their quotas. OPEC's production quotas are less of a factor in limiting supplies today, since members other than Saudi Arabia are almost all producing as much oil as they possibly can. Iraq's oil production hasn't recovered to its prewar levels. Has this had a major impact on global oil supply and prices? Yes. In January 2003, before the U.S. invasion, Iraq produced 2.5 million barrels of oil per day. Production fell sharply during the invasion, and recovered to as much as 2.3 million barrels per day in 2004. Last year, however, Iraq rarely produced as much as 2 million barrels a day. And in January of this year, daily production was only 1.6 million barrels. By itself, this would not be a huge loss to the world market. But coupled with supply problems in Nigeria, Venezuela and the Gulf of Mexico, it doesn't help. Some Republicans want to open up Alaska's Arctic National Wildlife Refuge (ANWR) to oil and gas drilling. What kind of impact might ANWR oil have on prices? The Energy Department forecasts that if ANWR were opened to drilling, it would add about 900,000 barrels of oil per day to global supplies. That would just about make up for the current gap in Iraq's production. But the new barrels wouldn't become available for many years. Are prices really that high when compared to other countries or to the gas crisis of the late '70s and early '80s? Is there any evidence that people are starting to change their habits in response to higher prices? When you ask drivers at the gas station, "Are you trying to conserve?," they invariably say they are. But weekly data from the Energy Department show that we're still using more gasoline than we were a year ago. It's likely that the pace of growth has slowed because of the high price. It also appears that people shopping for new cars are paying more attention to fuel economy than they were a few years ago. Buyers of hybrid and fuel-efficient diesel cars are already eligible for tax breaks, and this week President Bush called on Congress to expand those. The Bush administration is supporting an investigation into possible price gouging. Meanwhile, some members of Congress are talking about a windfall profits tax. Will those measures help? The government has conducted numerous investigations of suspected "price gouging" in the past; it usually finds that market forces of supply and demand, not illegal market manipulation, are responsible for high prices. The idea of a windfall profits tax was raised last year and went nowhere. Oil companies say taxing their profits would limit their ability to invest in new oil fields or refineries, although at least one proposal, from Sen. Byron Dorgan (D-ND), would tax only those windfall profits that were NOT reinvested. Are there any short-term fixes? The market solutions are: a) increase supply; and b) decrease demand. The seasonal crunch in refining capacity should ease in the next few weeks. But unless peace suddenly breaks out around the globe, crude oil supplies are likely to remain tight. So decreasing demand is our best hope in the short run. They're the same: increase supply and decrease demand. But in the long term, we have more opportunities to do this, by developing new oil fields, building new refineries, replacing gas guzzlers with gas sippers, and searching for alternative fuels.